Since I clearly don't have my life together enough to get out any kind of monthly favourites, I thought I'd just do alternating beauty and general/life favourites throughout the year and see how it goes. 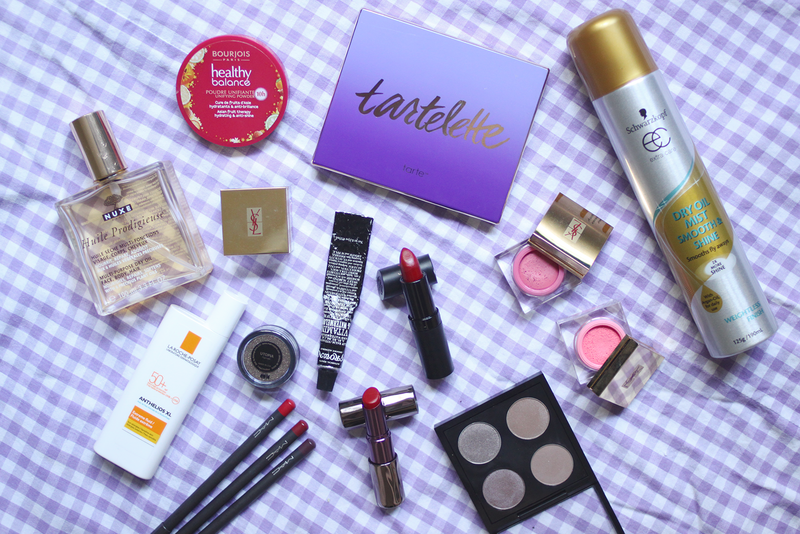 For my beauty favourites lately the star of the show has to be the Tarte Tartelette palette which will hopefully come to the Sydney Sephora soon, but I managed to get my hands on it because my friend brought it back for me from the US in January. This is what it looks like on the inside, and although I pretty much always use shimmery shadows as well, it's totally invaluable having a neutral matte palette because you have so many shades to choose from for your crease that there'll be something to compliment your look no matter what. The quad pictured is actually a MAC quad filled with MakeupGeek eyeshadows. After hearing so many YouTubers talk about them I decided to finally pick out a few for myself (L-R, top to bottom) - Moondust, Hipster (lol), Prom Night & Barcelona Beach. I also could not stop thinking about the pigment in Utopia which is a stunning antiqued gold that is INFINITELY more beautiful than it comes across in my crappy swatch up above. In fact, just ignore my swatch altogether and look at the one on their website, trust me. The shadows really are everything they're cracked up to be, and there although they all look pretty much the same in the photo (yeah, I know), they're actually really unique, interesting colours when you use them on your lips. I don't know what the deal is with these YSL cream blushes or if they're still available or not, but I picked up three of them while in Paris and they are absolutely stunning. I've got shades 4, 7 and 9 - a vibrant coral/orange, a neutral everyday dusty pink and a babydoll pink and I completely adore them and have been reaching for them a lot lately. They look so fresh and natural on the cheeks (as cream blushes generally do) and the shades are beautiful. I've also been loving an old favourite, the Bourjois Healthy Balance Powder which is a great, lightweight powder that never looks cakey on the skin. That's one thing that I really struggle with having oily skin - finding the right powder and using the right amount so that it controls oil but doesn't make my skin look super cakey and unnatural, and this is a really good one for that. As I mentioned in my life favourites/whatever that was post, I've been getting into lip liners lately, and the MAC ones are my favourite formula so far - pictured & swatched above are Cherry, Brick and Vino. What I love lipliner for is a) getting an even line around your lips when using liquid lipsticks that can make it really difficult, b) making your lipstick last longer and c) pushing your borderline lip colours the way you want them to go. For example, I could use Brick under Lime Crime's Wicked to make sure the colour comes across a super deep burgundy and to push out any purple or brown undertones that it can sometimes have, or I could use Vino under a brighter red shade to deepen it up. 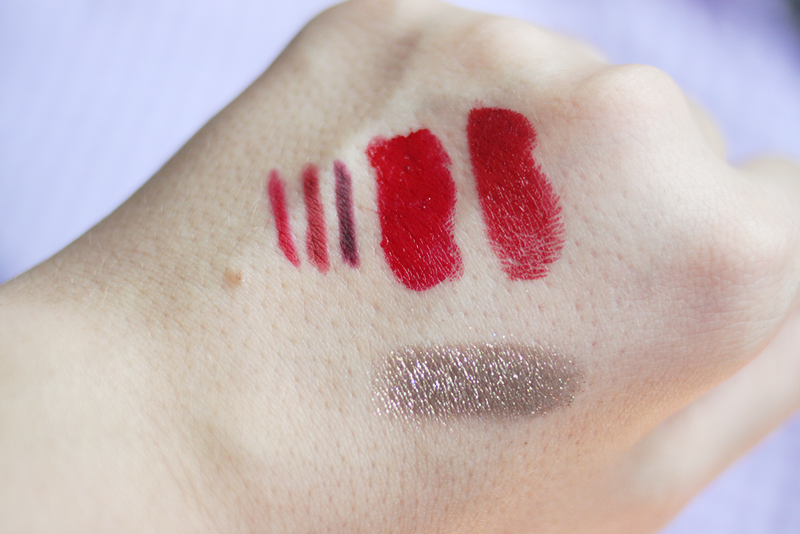 A combo I have seriously been into though is Cherry under the Urban Decay Revolution Lipstick in F-Bomb. When my friend came back from the states, along with the two eyeshadow palettes I mentioned in my last post I asked her to pick up Cherry and this lipstick for me, and they are S T U N N I N G. F-Bomb is the first lipstick swatched on my hand above and you can see how rich and deep but super vibrant the colour is. I'm telling you, when Mecca starts stocking Urban Decay products in March I'll be all over these lipsticks. Another red I've been loving lately is the Rimmel Kate Lipstick in 01. This is one of my favourite drugstore lipstick formulas so I thought I had all the colours I wanted from the range, but when I was overseas I spotted this shade and I don't think it was ever released in Australia but it's a gorgeous deep red that is probably a little darker than it looks in my swatch above and it's completely beautiful. My favourite lip balm at the moment has to be the Grown Alchemist Vanilla & Watermelon lip balm which I've had for a while so I'm trying to finish it up (over halfway, woo!) but it's a really lovely, glossy, nourishing formula that is perfect to put on before bed. I know I mentioned the amazing Mecca sunscreen recently and I really do love that one, but when Priceline had a 40% off skincare sale I had to pick up the La Roche-Posay Anthelios XL SPF50+ for days when I'm going to actually be out in the sun a lot and need a little extra protection, and I completely love the formula of this too. It's seriously lightweight, non-greasy and has no sunscreen smell at all. It's perfect if you want a high protection facial SPF that won't interfere with your makeup. I've also been getting back into using the classic that is the Nuxe Huile Prodigieuse which is a beautiful dry oil in a spray bottle that I've been using to moisturise my legs after showering and in the ends of my hair after I wash it. It feels and smells lovely and my bottle has lasted me forever. I'm not huge on hair products because I feel like my hair doesn't hold styles particularly well because it's so long and most products are probably made for people with shorter hair in mind. Also I don't really know what I'm doing with them. But I picked up the Schwarzkopf Dry Oil Mist on a whim a few weeks ago and I really like. It's a super fine mist that just de-frizzes your hair and takes the fluffiness out of it without weighing it down at all. So if that's something you struggle with as well then this could be worth a try.